White cotton patriotic handkerchief printed in blue with a map of South Africa, showing provinces, towns, roads and railways in miles, and the music and words of The Absent Minded Beggar - music by Arthur Sullivan, words by Rudyard Kipling. There is a picture of Lord Roberts, the British Commander in Chief, in the top left corner with the British flag and a picture of Queen Victoria in the bottom right corner with the words 'GOD SAVE THE QUEEN'. The edges of the handkerchief are machine stitched. The handkerchief was an initiative of the Daily Mail to raise funds for the 'Soldiers' Families Fund' after the outbreak of the Boer War (1899-1902). It is reported that 60,000 handkerchiefs were sent to Sydney, with a large proportion of them being sold by Messrs. Goulston Brothers of Brickfield Hill at three pence each. 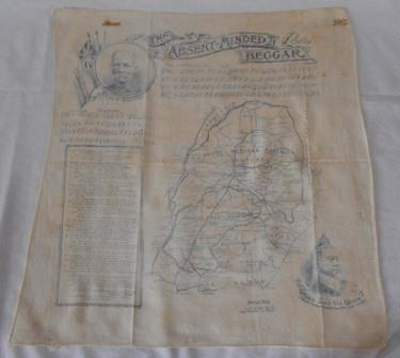 It is believed this handkerchief belonged to Edmund Aubrey Templar Pery [1845-1924]. The Hon. Edmund Aubrey Templar Pery was Police Magistrate at Kempsey and appointed visiting Police Magistrate at Port Macquarie in 1900. He took up his seat on the Port Macquarie bench on Tuesday 10 April 1900 and retired from the role in 1912. Written in ink at top 'Haus' and at top right hand corner are unreadable initials.